The Pitkin County Open Space and Trails Board voted May 7 to recommend the $2.5 million purchase of the 37.9-acre Deer Creek Ranch property. It is currently listed for sale for $2.9 million. Commissioners will consider an ordinance authorizing the acquisition on first reading next week; second reading and a public hearing are scheduled June 10. Among the parcel’s attributes is access to Arbaney Gulch, a stunning tributary to Snowmass Canyon. The general public has never before had access to the mouth of the gulch, where the property abuts the national forest. Imposing red cliffs mark the entrance, easily visible from Highway 82, opposite the Roaring Fork River. Deer Creek Ranch also offers 500 feet of Roaring Fork River frontage, plus access to existing public fishing easements to either side of the property where no public access currently exists. In addition, the parcel features about 10 acres of irrigated land and senior water rights from Deer Creek and the Eli Cerise Ditch, opening it to a potential agricultural lease. The Rio Grande Trail crosses through the property. The property’s attributes, particularly access to public lands, its scenic qualities, recreation potential and preservation of agriculture, fulfill the mission of the Open Space and Trails program on several fronts, noted Executive Director Dale Will. An old road winds up Arbaney Gulch. It is not recognized as an official trail by the U.S. Forest Service, but it is open to dispersed recreation for hiking and equestrian use only, Will said. Open Space and Trails will consult with the Forest Service and Colorado Parks and Wildlife before allowing access by the general public, he said. “The county’s decisions regarding public access will follow careful evaluation of potential habitat impacts,” he said. Motorized recreation, he added, is not permitted on open space properties. Deer Creek Ranch is a long, narrow parcel that extends from the mouth of Arbaney Gulch on its northeast end, across the Rio Grande Trail, Upper River Road, the river, the highway and up a flank on the southwest side of the highway. 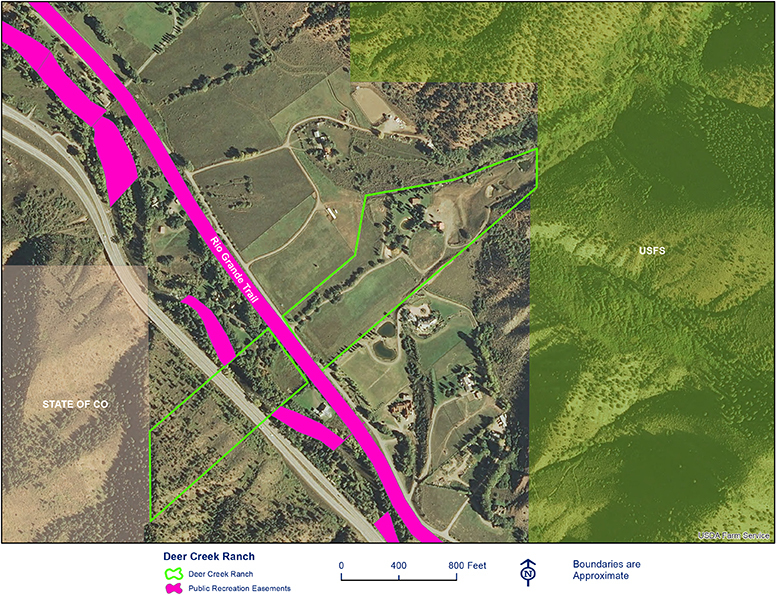 The Open Space and Trails Board has recommended purchasing the property outright, with the ability to transfer ownership of two small residences on the parcel in the future.